Also known as the Outer Hebrides, the Western Isles form a 130 miles arc running from north to south off the north-western coast of Scotland. Taken from north to south they include Lewis, North and South Harris, North Uist, Benbecula, South Uist and Barra. The southern half of the Western Isles is a necklace of islands and islets, often more water than land. Over the past 60 years they have steadily been linked together by causeways and bridges. It is now possible to land from the Sound of Harris Ferry on Berneray, and use a string of causeways to cross North Uist, Grimsay, Benbecula, South Uist and, using the most recent of the causeways, to one of the jewels of the Western Isles, Eriskay. Another causeway takes you to the island of Baleshare, off the west coast of North Uist. 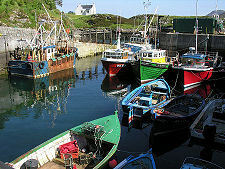 For accommodation in Uists & Barra see the links in the "See and Stay" menu above. See the map below for an outline of Uists & Barra and links to connecting areas. Inter-island transport has also been transformed in other ways. Until 1996 you could only transport a car from Harris to North Uist via the triangular service that also links both to Uig on Skye. That changed with the introduction of the Sound of Harris Ferry from Leverburgh on Harris to Berneray. And a ferry now provides a direct service across the Sound of Barra from Eriskay to Barra. 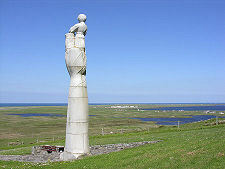 Lochmaddy is the main centre on North Uist and is home to the ferry terminal for sailings to Uig on Skye. The Sound of Harris Ferry calls at the linked island of Berneray, an extremely beautiful northern terminus for the Uists. The causeway south from North Uist takes you across the tip of the attractive island of Grimsay before arriving on Benbecula. Benbecula's main centre of population is at Balivanich. This is also home to Benbecula Airport. The east side of Benbecula is remote, rocky and largely inaccessible, while the west is home to some of the extensive beaches for which the Uists are famous. North of Benbecula the Western Isles are largely Protestant, and Sunday observance is strong. South of here the islands are overwhelmingly Roman Catholic, and a more relaxed approach is taken to weekends. As a result visitors will find that the Uists are an easier place to visit over a Sunday than Lewis and Harris. South Uist is the second largest of the Western Isles with Lochboisdale, near its southern end, the main population centre. It is also the terminus for the ferry to Oban and Castlebay. In the east the mountains of Beinn Mhor and Hecla dominates the landscape, in the west there is duneland and some beautiful sandy beaches, though not many are easily accessible and some are affected by the military missile testing range that lies offshore here. Whatever you do, make the effort to take the side road the short distance west to the tiny settlement of Howmore, one of the most attractive in the Western Isles. Other settlements include Geirinis, Daliburgh and Pollachar. 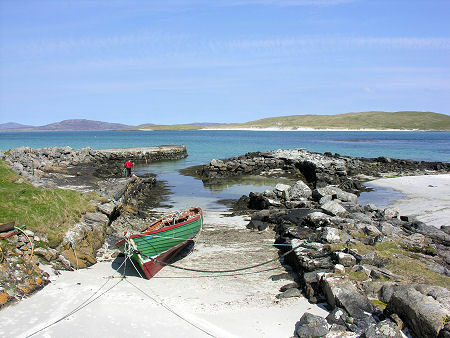 Connected by its new causeway to South Uist is Eriskay, in some eyes the most beautiful spot in the whole of the Western Isles. For others this honour goes to Barra, a little to the south. 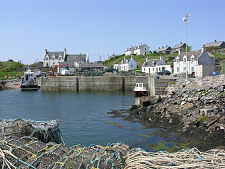 This is now linked by the Sound of Barra Ferry to Eriskay, and from its largest village, Castlebay, there are ferry connections with Oban and with Lochboisdale on South Uist. Barra has a varied and beautiful landscape with mountains and spectacular beaches. 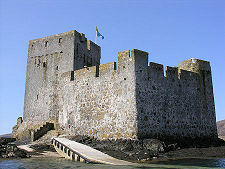 Visitors can learn more about the island and its history at the Barra Heritage Centre in Castlebay or visit Kisimul Castle, a twelfth century castle situated on an islet in the bay. Other settlements on Barra include Eoligarry, Borve and Northbay. 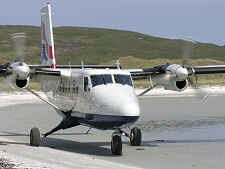 Barra is also famous for being home to Barra Airport, the world's only beach airport that operates a scheduled airline service. And a final causeway links Barra with the Western Isles' most southerly inhabited island, Vatersay. Islands further south in the archipelago are now uninhabited. 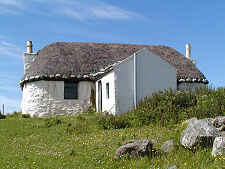 One of them, Mingulay, once supported a significant population, but the last residents left in 1912.